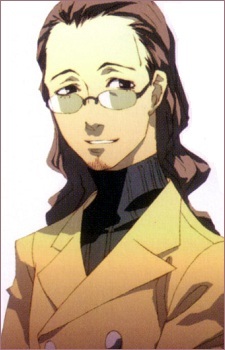 Initially, Ikutsuki appears as the cheerful advisor, chairman, and "boss" of SEES, always trying to keep the group in high spirits while discovering secrets about the Shadows. In truth, Ikutsuki is working toward a completely opposite end, sharing Mitsuru's grandfather's dream of The Fall and the coming of Nyx. He was one of the scientists involved in the experiments at Gekkoukan ten years ago, including the creation of artificial Persona-users. Ikutsuki manipulates SEES to destroy the twelve Arcana Shadows, promising them that once they do so they will eliminate the Dark Hour. But killing the twelve Arcana Shadows actually melds them together, allowing for the re-emergence of the thirteenth Arcana, Death. It is Death's function to summon Nyx and destroy the world. After his lies are discovered, Ikutsuki reprograms Aigis to sacrifice the members of SEES as offerings for Nyx, and then kills Takeharu Kirijo. When Aigis breaks the programming and frees SEES, Ikutsuki jumps to his death from the top of Tartarus after being wounded in the stomach by a bullet. Unfortunately, his mission to revive Death was already complete by the time of his suicide.